State Sen. Nikiya Harris Dodd (front, center), state Rep. Evan Goyke (third from left), and Ald. 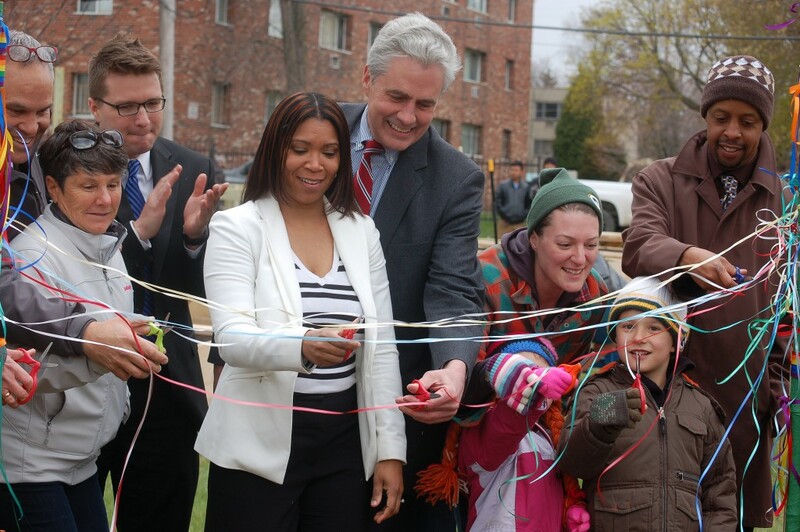 Robert Bauman (center, rear) join volunteers in a ribbon-cutting ceremony at Neighborhood House of Milwaukee’s Garden Park groundbreaking. Photo by Andrea Waxman. Earth Day in Milwaukee dawned cold and gray but that did not discourage 60 residents, elected representatives, Neighborhood House of Milwaukee staff and volunteers from turning out for a ceremonial groundbreaking at a new community garden at the corner of West 27th Street and Richardson Place. If neighbors in the Concordia area get involved in planting and harvesting, “it will pull people together a little bit. It will be a nice gathering spot,” said State Street resident Marilynn Weiland, who brought her 3-year-old grandson and another toddler in a wagon. Community and professional landscaper volunteers invested many hours of work at the Richardson Place Community Garden Park in the days leading up to the groundbreaking. Already visible are the outlines of planting beds and a play area. A small amphitheater and rain gardens will soon follow. And the planners are seeking permission to have a mural painted on the side of a building at the garden’s south border. “We left some space on the outside to inspire a farmers/art market, so (there is) space for the tents and for the people,” said volunteer Bradley Blaeser, CEO of The Green Team of Wisconsin, Inc., who donated the garden design. And that wide perimeter also gives the garden a more intimate feel, Blaeser added. A Neighborhood House outdoor and environmental educator from 2001 to 2007, Blaeser spearheaded the fundraising and persuaded the Wisconsin Landscape Contractors Association (WLCA) to commit its annual day of service to the project. 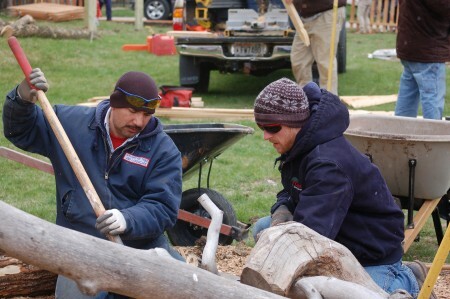 Rolando Morgado Sanchez (left) and Michael Peterson of the Wisconsin Landscape Contractors Association build a balance beam out of tree trunks and branches. Photo by Andrea Waxman. Students from the International Learning Center, 639 N. 25th St., joined WLCA volunteers. Patrick Rich, who teaches English as a Second Language (ESL), explained that many of the center’s students come from predominately agricultural countries and are expert farmers. “It’s nice to give them an opportunity to show what they know,” Rich said. A program of Neighborhood House, the center offers English language instruction and other help to refugees and immigrants. Neighborhood House has worked to get residents involved in agriculture for decades, said Executive Director Jeff Martinka. Though it has a smaller garden containing raised beds, a pollinator garden and an area for honeybees south of its building, “we wanted to have something that was much more ambitious, that was close to where we work with our preschoolers and our kids,” Martinka said. Neighborhood House is located half a block west of the garden. The organization is committed to promoting healthy eating, and demonstrating the affordability and relative ease of growing vegetables, Martinka explained. In addition to expanding its urban agriculture program, the garden space will also provide a pocket park in an area that doesn’t have other parks, Martinka noted. It also gives Neighborhood House a greater presence on a main Concordia thoroughfare and therefore a stronger link to the community, he added.